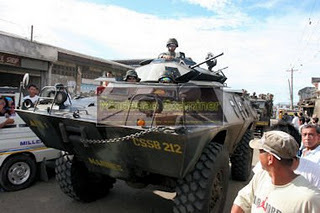 ZAMBOANGA CITY (Mindanao Examiner / Oct. 31, 2011) – The Philippine military on Monday said two of 3 Abu Sayyaf militants killed were sub-leaders and that there were probably two more casualties in military air strikes in Sulu’s hinterlands. The Western Mindanao Command, which ordered the air strikes on a mountain hideout of the Abu Sayyaf and Jemaah Islamiya on Sunday, identified the slain sub-leaders as Ben Wagas and Apo Mike, and a follower Abu Abad. Latest military intelligence report also said that two more Abu Sayyaf militants – Sali Madarang and Andag – were killed in the raid. “We have identified the bodies of those killed and two of them were notorious Abu Sayyaf sub-leaders. Two other (militants) were reported killed Sali Madarang and Andag,” Army Lt. Col. Randolph Cabangbang, a spokesman for the Western Mindanao Command, told the Mindanao Examiner. He said government operation is continuing against the Abu Sayyaf and Jemaah Islamiya, including those who are harboring or protecting the terrorist groups. “This operation will go on as long as the Abu Sayyaf and Jemaah Islamiya and those that are protecting them,” the official said. Air force OV-10 bombers targeted the groups’ hideout in the mountainous area of Karawan in Indanan town. The targets of the operation were Abu Sayyaf leader Umbra Jumdail alias Doc Abu, and several Jemaah Islamiya terrorists, among them were Malaysian Zulkifli bin Hir, also known as Marwan, and Mauiya, an Indian citizen; who are all wanted by the US government on terrorism charges. There was no report if any of the three men were killed or wounded in the fighting.